On the 18th (Sun), see the interesting displays at Museo Nazionale del Cinema, then make a trip to Piazza San Carlo, and then explore the world behind art at Egyptian Museum of Turin. To find more things to do, other places to visit, photos, and more tourist information, refer to the Turin trip planner . Curitiba, Brazil to Turin is an approximately 19.5-hour flight. You can also do a combination of flight and train; or do a combination of bus, flight, and train. You'll lose 4 hours traveling from Curitiba to Turin due to the time zone difference. When traveling from Curitiba in November, plan for colder days and a bit cooler nights in Turin: temperatures range from 11°C by day to 7°C at night. 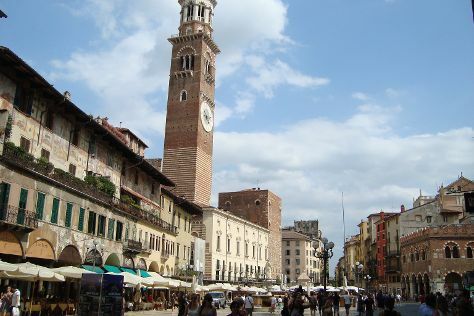 Finish your sightseeing early on the 18th (Sun) to allow enough time to take a train to Verona. Start off your visit on the 19th (Mon): enjoy breathtaking views from Torre dei Lamberti, then wander the streets of Piazza delle Erbe, then admire the striking features of Casa di Giulietta, and finally catch a live event at Arena di Verona. To see where to stay, other places to visit, more things to do, and more tourist information, read Verona travel route planner. Traveling by train from Turin to Verona takes 2.5 hours. Alternatively, you can drive; or take a bus. In November in Verona, expect temperatures between 14°C during the day and 5°C at night. Wrap up your sightseeing by early afternoon on the 19th (Mon) to allow time for the train ride to Milan. For other places to visit, maps, traveler tips, and more tourist information, go to the Milan holiday planner. Traveling by train from Verona to Milan takes 1.5 hours. Alternatively, you can drive; or take a bus. In November, daytime highs in Milan are 15°C, while nighttime lows are 6°C. Finish your sightseeing early on the 19th (Mon) so you can travel back home. Start off your visit on the 20th (Tue): contemplate the waterfront views at Canal Grande, admire the striking features of Doge's Palace, then enjoy breathtaking views from St Mark's Campanile, then snap pictures at Ponte dei Sospiri, and finally get the lay of the land with Walking tours. On the next day, steep yourself in history at Squero di San Trovaso, then contemplate the long history of Peggy Guggenheim Collection, then take in the architecture and atmosphere at Basilica di Santa Maria della Salute, and finally get to know the fascinating history of St. Mark's Square. For more things to do, ratings, and other tourist information, go to the Venice online tour itinerary planner . Take a train from Milan to Venice in 2.5 hours. Alternatively, you can drive; or take a bus. In November, daily temperatures in Venice can reach 15°C, while at night they dip to 7°C. Wrap up your sightseeing by early afternoon on the 22nd (Thu) to allow enough time to travel back home.